Another long weekend is approaching, and instead of staying at home and sleeping for three days straight, here are some suggestions for where to go for Columbus Day Weekend. Probably the most fashionable city in the world, New York City is only a four or five hour drive from Boston. On 5th Avenue you’ll find all the top brands and expensive clothing stores like Saks Fifth Avenue and Bergdorf Goodman. That might be a little pricey for us students, but we can still shop in SoHo at stores such as Adidas. They usually have the most up-to-date clothes in addition to great sales. 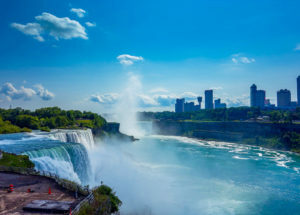 Buffalo, New York is only an hour and a half away from Boston if you fly, and when you get there you can check out one of the largest waterfalls in the world. The best season to visit Niagara Falls is autumn, before winter comes and the temperature is cool instead of freezing. Since so many tourists visit, visitor services offers free raincoats — you can walk down to the falls and feel the falling water spray on you. Sometimes, on sunny days, you can even see a rainbow. Just make sure to be careful of your phone and camera, because they will almost definitely get wet (even if you think the raincoat is covering them) — I would recommend buying a waterproof case before you visit. If you bring your passport, you can even check out the Canadian side of the falls, which supposedly offers an even better view. After sightseeing at the waterfall, don’t forget to grab some Buffalo chicken wings. They just taste better if you actually eat them in Buffalo. Columbus Day weekend falls at the perfect time where the leaves are changing colors. It might be a bit too early to see the maple leaves in their full red glory, but the White Mountains are still a great place to relax and get closer to nature after a tough month of schoolwork. There are many historic sites in the White Mountains that are pretty close to Boston, so you can take a day trip to go hiking or stay in an Airbnb if you want to get away for longer. There are also farms and breweries where you can taste the local flavors. Renting a Zipcar and driving around the beautiful scenery is an unforgettable experience (and don’t forget there is no sales tax in New Hampshire, so do some shopping while you’re up there, too).